Town Reports, Rockport and Gloucester 1838-1848 (TC) Original printed broadsides, rolled. including Pigeon Cove Wharf, Wastewater Treatment Plant, Police, Licenses, Dog Hearings, Thacher’s Island, Town Memorial Clock papers, land purchased by town, papers relating to Motif #1 (1978) and Bicentennial meetings. contains copy of petition to separate from Gloucester, warrants, town meeting records, elections, road records, deeds, jury lists, etc. Contains warrants, town meetings, and town and state elections. First two volumes labeled “Warrants” but contain more. Town Meeting records are written in the form of transcripts. Supporting documents including copies of warrants, committee reports, petitions, and correspondence. original manuscript showing polls and estates on Cape Parish, presented to town by Ebenezer Pool in 1857. Contains Pool’s notes and emendations. Document restored by Northeast Document Conservation Center in 1980 with a grant from Rotary Club. Contain handwritten warrants, election results, copies of ballots pasted in, for town, state and national elections. Contains information on Historical Commission survey and applications; research on historic Rockport streets, houses and properties. Located with Papers of the Sandy Bay Pier Co. Licenses for junk dealers, sellers, common victuallers, innholders, hawkers, peddlers and used car sales. Volume 1 also contains selectmen’s contracts with utility companies. Includes store accounts, mackerel packing and farm labor, fish peddlers, carpenters and postmasters. Includes legal and tax documents, deeds, vessel documents, correspondence. Includes account books, bills, ships papers, time and boarding books, correspondence, leases and store inventories. 6 account books, miscellaneous papers. Record of purchases for building Baptist meeting house kept by Ebenezer Pool , Jr. (1808); account of pew owners (1818); and plan of meeting house and pews, including 1836 alterations. According to Record Book #1, “When the present church building was dedicated in 1867 an address and other documents, photographs, ;etc. were deposited in a tin box and directed to the Baptists of Rockport in 1908 and 1958. The box is in the care of the Clerk or Treasurer.” Contains copies of local newspapers, anniversary programs, correspondence, printed sermons, church histories, and photographs. 1 archival box containing handwritten sermons of Wakefield Gale, correspondence, testimonial. Contains lists of ministers, historical and genealogical notes on ministers, typed historical sketches, historical background material, copies of speeches or articles by or about ministers, newsclippings, original and scanned copies of photographs, printed memorials and obituaries, 19th and 20th c. programs and orders of exercises. Baptisms, marriages and burials, newsclippings, 1892 list of subscribers, a history of the parish from 1872 to 1892, by-laws, a record of services, and annual meeting minutes. d) Annual Bulletin of the Rockport Public Library: 1931, 1933-1935, 1937.
e) Circulation notebooks (4) November 1935-June 1940, July 1945-October 1949, November 1949- February 1953, March 1953-December 1956, 1963-1968. Contains papers relating to the 2nd Regiment, 1st Brigade of the Massachusetts Militia, including a Brigade and Regimental Orders Book (1818-1840), orders, and returns. Includes correspondence with Morris Sanders, notes, sketches and biographical information. Includes letters from William junior, Lucius P. and Sylvester G. Caldwell to their mother, letters to Eliza (Goss) Caldwell from John Rogers, and letters between other Caldwell family members. Includes correspondence of Rev. Wakefield Gale (1828-1883), Mary Gale Diaries, (9 volumes, 1826-1861), commonplace books, sermon books and church reports of Rev. Gale, Gale family genealogy. bound volume, appears to be the original. Labeled #75. May have been given to the town by Ebenezer Pool. Papers of William, Joseph, Thomas and Dr. Benjamin Haskell, including deeds, correspondence, a temperance lecture and writings on mental diseases. Primarily the papers of Dr. John Manning, including his medical books, correspondence, accounts, papers relating to the Fifth Parish meetinghouse (1794-1826), account books, deeds, a series of day books, and estate papers. Other family members represented in the collection include James Manning, Dr. Joseph Manning, William Manning, Charles Bolles Manning and John Manning Waldoborough. Contains personal papers, handwritten reminiscences, and a collection of historical documents including numerous Rockport deeds, genealogical papers of the Gott and Pool families, and papers relating to the 2nd regiment, 1st brigade of the Massachusetts Militia (1816-1840). 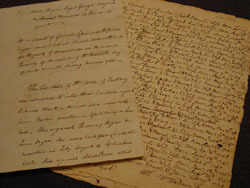 Includes correspondence and personal papers; Hall family papers; genealogical research for Tarr, Pool, Stevens, Norwood and other Rockport families; the genealogical research papers of Annie Rowe; research on Rockport’s historic streets, houses and properties; research on early Rockport industries; and records relating to the Rockport Historical Commission, Rockport Historic Districts Commission, Sandy Bay Historical Society, Millbrook Meadow committee, Rockport Garden Club, and Rockport Art Association. Presented by Francis Norwood to his daughter Mrs. Jerusha Kinsman in 1823 as a marriage present. Contains Pool family records. Correspondence, wills, deeds, and estate papers of John Pool, Francis Pool, Aaron Pool, Winthrop Pool, Caroline S. Poole, William H. Poole, and Ebenezer Pool. Includes a manuscript history of Rockport in 5 notebooks, historical notes contained within a series of 8 envelopes labeled A-H, a history of the Baptist Church, a ledger book, receipts, accounts and an estate inventory. Includes wills, deeds, estate papers, tax bills of various family members, and the account book of Major John Rowe. Includes books of Francis Tarr, William Tarr, Jonathan Parsons, Asa Tarr, James Gott, Peggy Tarr, James Story, Ebenezer Oakes and William Grover, largely undated. Rockport High School Graduation Programs, 1871- present (SBHS Archives). Includes yearbooks (1942-2004), annual reports (1970-2003), correspondence, awards and certificates, project files and Millbrook meadow scrapbook. Includes record books and board meeting minutes (1914-1969), annual reports and treasurer’s reports (1937-1951, 1965-1967), yearbooks (1939, 1945-1979), financial records, correspondence and scrapbooks. Contains genealogies and genealogical research for Tarr, Poole, Stevens, Norwood and other Rockport families. Also includes the genealogical research papers of Annie Rowe. 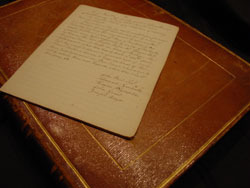 unpublished manuscript, historical notes from various sources. 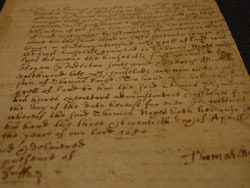 Manuscript research notes compiled by Gott. Bound but covers are missing. Contains research on historic Rockport houses, streets and properties, early Cape Ann history, early Rockport industries and other topics. © Copyright 2008 Sandy Bay Historical Society • All rights reserved.